Bloating occurs when gas that doesn't pass through your system by belching or flatulence builds up in the stomach and intestines. It can feel like a swelling or tightness in the abdominal area and can lead to mild and dull or sharp and intense pain. Bloating can be brought on by stress, anxiety, smoking, gastrointestinal problems or the foods you eat. Cashews might cause bloating in some people for different reasons. Eating fatty foods is one common cause of bloating, and cashews, like all nuts, contain a lot of fat. The Ohio State University Wexner Medical Center notes that fat delays stomach emptying, and that can increase the sensation of fullness that leads to a bloated feeling. A 1-ounce serving of dry-roasted cashews contains 13.1 grams of total fat — 2.6 grams of saturated fat and 10 grams of unsaturated fat. Eatma nuts in moderation, ideally as a substitute for the saturated fats found in meats, eggs and dairy products. If you get too much fiber in your diet or you add fiber to your diet too quickly, it can cause bloating, gas, cramps and diarrhea. Cashews are not extremely high in fiber, but all nuts contain some fiber, so go easy on the cashews if you already eat a fiber-rich diet. A serving of 18 cashews has 1.1 g of fiber. Fiber is important for the digestive process, so if you're trying to add more fiber to your diet, build slowly to reduce the risk of bloating and other abdominal distress. One symptom of bloating is abdominal pain, and abdominal pain can be a symptom of a food allergy. Nuts are among the most common food allergens. Food allergies can be severe and in extreme cases cause an allergic reaction called anaphylaxis, which can lead to coma or death if not treated promptly. Most food allergies are caused by certain proteins in shellfish, fish, eggs, peanuts and tree nuts, such as cashews. In children, the foods most likely to cause allergic reactions are eggs, milk, wheat, peanuts and tree nuts. 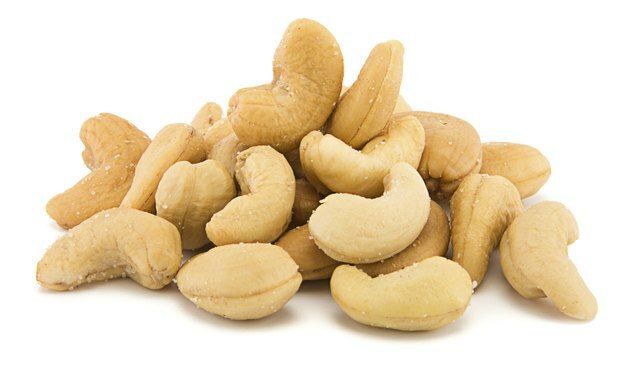 If you're allergic to cashews, even a tiny amount can trigger reactions, but many people instead have a food intolerance that might allow them to eat small quantities of the problem food without a reaction. The two can be confusing, but rather than triggering an immune system response, a food intolerance might just cause uncomfortable symptoms such as bloating, gas and diarrhea. If you think you might have an intolerance for cashews, try eliminating them from your diet for a while and see if it makes a difference in the amount of bloating you feel.